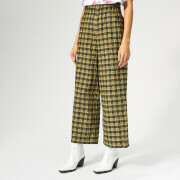 Women’s trousers from French fashion label A.P.C with a straight cut and tailored in a slightly tapered design. Cut from flowing Italian viscose-virgin wool blend twill, the high-rise ‘Isa’ trousers comprise an inset waistband with a double button closure and multiple belt loops above the zip fly, Italian side pockets with faux flaps and flat, inverted pleats along the front. Featuring back piped pockets with buttoned flaps, back darts and complete with a removable buckled belt with embroidered eyelets.